In 1959, Ip Man (Donnie Yen) is settling into his low-profile life in Hong Kong. 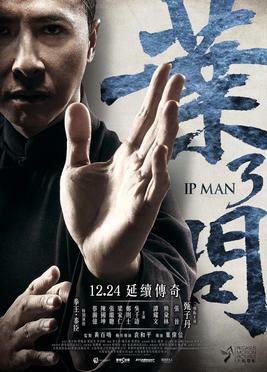 The film begins with Ip Man practicing his techniques on a wooden dummy, as a moth, foreshadowing the future, gently flutters and lands on the dummy. The opening subtitles explain that his elder son, Ip Chun, has returned to Foshan to study, leaving him with his younger son Ip Ching and his wife Wing-sing. A young Bruce Lee visits Ip and asks to become one of his students. After demonstrating his speed to Ip, Ip neither accepts nor rejects him and tells him to "come back later". Ip Ching is seen fighting with another boy, Cheung Fung, at school, and both boys end up with minor injuries. Wing-sing, along with Ip, is asked by Miss Wong, the boys' teacher, to come to the school. As an apology, the Ip family invite Cheung Fung to their home for dinner. At Ip's house, Cheung Fung displays rudimentary yet impressive Wing Chun skills. When Ip asks the boy who his mentor is, he says that it is his father, Cheung Tin-chi. Cheung shows up to pick up his son shortly after. Cheung is seen participating in black market boxing matches and having a streak of victories. The organiser, Ma King-sang, a local triad leader, also works for Frank (Mike Tyson), an American property developer. Frank orders Ma to acquire a piece of land occupied by the school where Ip Ching and Cheung Fung study. Ma asks for a month for it to be done, but is threatened into assuring that it will be done within two weeks. Meanwhile, Frank is impressed by Cheung's Wing Chun skills. The next day, when Ip goes to pick up his son from school, he witnesses Ma and his men coercing and beating the headmaster, who refuses to sell them the school. Ip interferes and restrains Ma, but is forced to let Ma go as Ma's men are holding Miss Wong at knife point. Ip seeks help from Sergeant Po (called Fatso by his friends), a close friend of his and a local police detective. Fatso agrees to help Ip, but claims a shortage of manpower and influence. Ip then agrees to guard the school alongside his students. That night, Ip and his students watch the school compound. Lik, Ip's oldest student, develops a crush on Miss Wong, but the latter promptly rejects his advances. Realizing that it was getting late, Ip suggests Lik and the other students return home; however, immediately after that, Ma's men invade the compound. Although Ip and his students are able to hold them at bay, they are still outnumbered as the gang manages to kidnap the headmaster and set fire to a few classrooms. Cheung, who happens to pass by, helps fight off the invaders and rescues the headmaster. Cheung's skills impress Ip, and Ip thanks Cheung for his help. Tin Ngo-san, a local martial arts master and Ma's former mentor, is enraged by Ma's unscrupulous acts, and accompanied by Ip, confronts Ma at the Hong Kong shipyard and slaps him in front of his men. Ma retaliates with a hidden knife, but Ip is able to stop him from nearly stabbing Tin and again restrains him. Fatso arrives and keeps the situation at bay, but Ip eventually lets Ma go to deescalate the situation. Humiliated, Ma finds Cheung and offers him a job: to get revenge against Tin on his behalf. Desperate for money to open his own martial arts school, Cheung accepts the offer. Meanwhile, Wing-sing is diagnosed with stomach cancer. Cheung, whose face is hidden with a bandanna, finds Tin in his umbrella shop and proceeds to fight him, with Tin failing to defend himself against his assailant's swift blows, and ends up in the hospital with a broken arm. Ip receives a call from the hospital and visits Tin. Upon knowing that Tin did not call him, Ip realises that it was a set-up by Ma to lure him away from the school, so that his gang could kidnap some of the students, including Ip Ching and Cheung Fung. Ip arrives at Ma's shipyard surrounded by Ma's men. Ma, who is holding Ip Ching at knife point, threatens to sell the kids off to slavery if the headmaster still refused to surrender the school. Upon knowing that his son was also kidnapped, Cheung arrives, picks him up, and promptly leaves; but after his son tells him that "his friends are still there", he returns and fights alongside Ip. Ip and Cheung are able to hold their own, until a troop of policemen led by Fatso comes to arrest the gang, while Ma flees. Ma is later fired by Frank after the incident, and is replaced by a proficient Thai boxer to go after Ip instead. Returning home, Ip is told by Wing-sing about her condition, and that she may only live for six more months. While taking Wing-sing to the clinic, Ip is attacked by the Thai boxer, who is promptly defeated after a few moves. Fatso later tells Ip about Frank, who wants to eliminate Ip at all costs for obstructing his plans. Ip decides to confront Frank in his office. Frank challenges Ip to a three-minute fight— if Ip can withstand his fists for three minutes, he would leave the school, Ip, and his family alone; a challenge that Ip accepts. From the outset, Ip is seemingly overwhelmed by the sheer muscle and force of Frank, who dominates the fight thoroughly. Realising he is no match for Frank in terms of speed and power, Ip attacks Frank's footwork instead and is able to launch a few punches on him. Just as both are about to launch a decisive blow on each other, three minutes had passed. Ip leaves the office and Frank keeps his promise, seemingly impressed. Cheung, with the money he obtained from Ma earlier, opens his martial arts school, and claims that his Wing Chun is genuine while Ip's isn't. Cheung proceeds to defeat a number of martial arts masters and becomes famous on the news. Finally, he challenges Ip to a battle that will decide who is the true Grandmaster of Wing Chun. Meanwhile, Ip spends more time with his dying wife. On the day of the match, Ip chooses not to attend, but instead goes out dancing with Wing-sing (after having been taught a few moves by Bruce Lee, whom Ip finally accepts as a student). Some of those who attend the match become impatient, as Cheung waits for his opponent. Ultimately, Cheung is declared the winner, owing to Ip's failure to attend. Wing-sing, despite being happy about Ip's decision to accompany her, makes an appointment with Cheung for another match on Ip's behalf, as she knew that Ip would have attended if not for her condition. Wing-sing accompanies Ip to the fight. They first fight with Six and a Half Point Poles, which Ip and Cheung fight to a standstill. They then fight with Butterfly swords, with Ip seeming to win narrowly. When Cheung loses his swords, Ip throws his away, and they proceed to fight without weapons. They both seem evenly matched, with both being able to deliver several blows to each other. However, Cheung successfully lands a blow to Ip's right eye, temporarily blinding him. Cheung's victory seemed certain, but Ip evades Cheung's following hits with his hearing, and counters Cheung with a one-inch punch, despite not being able to see. Defeated, Cheung relinquishes his title as the Grandmaster of Wing Chun, and chooses to destroy the banner that proclaimed himself to be the Grandmaster. Ip then remarks that, "What's most important are the ones closest to us", and leaves. In the epilogue, it is revealed that Wing-sing passed away in 1960, and that Ip helped make Wing Chun well known internationally and left a legacy.